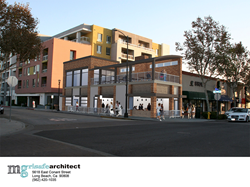 Long Beach architecture firm M. Grisafe Architects announced recently that the City of Downey’s Planning Commission has approved their building design for a new restaurant space, which will be located on the corner of Downey Avenue and 2nd Street in Downtown Downey. We were very pleased to receive unanimous approval from the City of Downey’s Planning Commission for this project. We think this renovated space will be a great addition to city’s downtown area, which has seen some exciting new growth in recent years. Long Beach architecture firm M. Grisafe Architects announced recently that the City of Downey’s Planning Commission has approved their building design for a new restaurant space, which will be located on the corner of Downey Avenue and 2nd Street in Downtown Downey. The plans for the restaurant include a second-story addition to the existing building that will feature a covered rooftop deck for dining. On the street level, patio seating will be added on the north side of the building for additional eating space. The building that will house the new restaurant has been vacant since 2013, except for brief use in 2016 as the campaign headquarters for a local politician. The redesigned building will be modern in its architecture, with rustic elements such as used brick, panels with a weathered wood appearance, and metal canopies above the building’s windows and doors. Once completed, the building will have a total of 1,962 square feet, with an additional 203 square feet of outdoor dining space on the ground level and 776 square feet of dining area on the covered rooftop deck. M. Grisafe Architects is a full-service commercial and residential architecture firm based in Long Beach, California, offering commercial building planning and tenant improvements, new home design and custom remodels, landscape design, and interior design. With every project, they strive to exceed their clients’ design needs and help protect the finished projects from known risks and costly challenges. Learn more about M. Grisafe Architects and see examples of their work at http://mgrisafearchitect.com.